Kyle Edghill (left) and teammate Elishaba Johnson about to serve in their doubles encounter. and Elishaba Johnson all 15-year-old players ensured the lads from the Land of Many Waters continue their dominance of the sport at the Inter Guiana Games level when they both won gold medals yesterday. 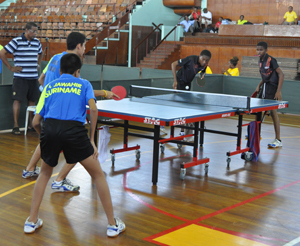 Playing at the Anthony Nesty Sports Hall, the young Guyanese brushed aside the host nation’s A and B teams as well as French Guiana. The B Team is used as a development team so the point against them does not count in the overall tally. Guyana won all its matches (singles and doubles) by respective 3-0 margins. In the Doubles match, Jackman and Greaves brushed aside the Fatal sisters 11-7, 8-11, 11-6, 11-6. Edghill got the better of Jean-Christophe Cognat in a five set thriller 11-5, 11-9, 7-11, 4-11, 11-8. Edghill and Johnson returned as a unit to brush aside Banai and Cognat 11-9, 11-9, 11-8. The Coaching Staff as a collective, Melissa Dow-Richardson, Xenophon Goliah and Linden Johnson said they were very happy with the performance of this young and talented team. 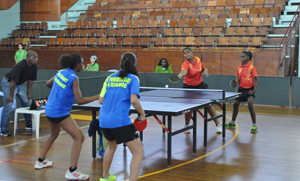 The Guyanese pair of Priscilla Greaves and Selenas Jackman (left) in their doubles match against Suriname. The staff noted that the Surinamese are leaving no stones unturned to get past Guyana and have engaged the services of a Dutch Coach for their team who would be working with them for the next six months. They also stated that they have seen a marked improvement in the Surinamese game in the past 12 months or so. Meanwhile, the female volleyball team lost to French Guiana three sets to one last evening winning the second set of the game. And the Chess team won against French Guiana but lost to Suriname, they will play the Surinamese B team today.